You probably didn't know Charlotte had a professional indoor football team. Well, the Carolina Speed play their home opener tomorrow night against the Columbus Lions, and they're coming off a season-opening win last Saturday against the defending champion Florence Phantoms. 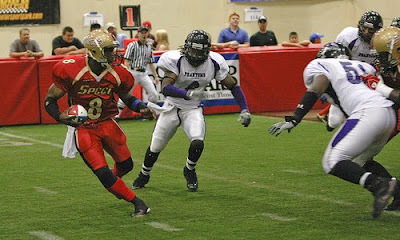 The Speed are in their third season as part of the American Indoor Football Association (AIFA), but this is their first season playing in Charlotte after the new owner moved the team here from Concord. Tomorrow night is the first of seven home games at Bojangles' Coliseum (formerly Cricket Arena). All home games start at 7 p.m. You can also meet the players and coaches along with the Velocity Girls (the Speed's cheerleaders) tonight during a special event at the Double Door at Lake Norman. Click here for more details on this event and the Speed's season.